I have an easy tip for you for melting chocolate! Whether you are dipping truffles, cookies, hot cocoa spoons, or bacon (hey, I am not going to judge, it sounds delicious! ), this is an easy simple way to keep your dipping chocolate ready to go, without overheating and without it getting lumpy! This tip works with every type of chocolate I have tried, and even works with the little melty discs. It even works if you are doing facing chocolate work, and using a tipped bottle! Add your chocolate to jars. Add those jars to a slow cooker. Turn slow cooker on high and add HOT water, so that it reaches about halfway up the jars. I like to add a heavier cookie sheet on top of the jars before I add the water (then take it off as soon as the water is poured). This prevents the jars from possibly tipping over if I pour the water in too fast, and it also prevents water from getting in the jars. Water combined with dipping chocolate is a bad thing, meaning your chocolate is going to seize up and make it useless, unless you plan on digging it out with a spoon and eating it. My chips took about 45 minutes to heat up and with a little stir they combined easily. The chocolate stayed a nice consistency for about three and a half hours this way. I caution you when you move jars out of the pot, don't drip water into the other jars. 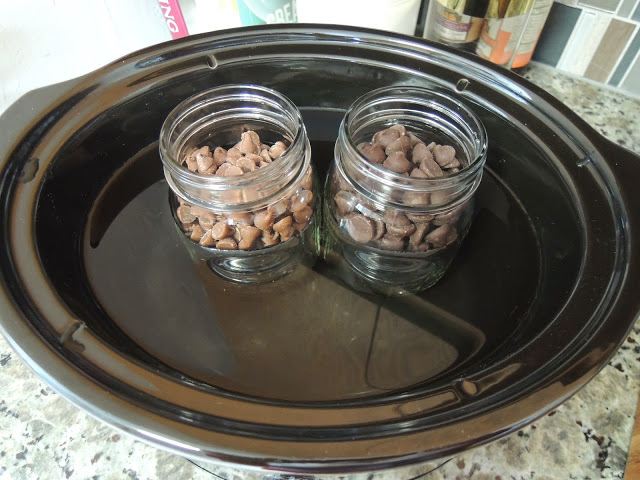 To refill jars with additional chocolate, simply add it with a spoon, the heat of the other chocolate will help melt the new chips. I haven't tried it, but you could do this same thing in a little tiny dipper crock pot, with one flavor of chip, if that was all you needed. Another super top secret tip, this works awesome for caramel!!! Making caramel apples a breeze with easy clean up just might be dangerous! Secrets out!